Mexican-born and Los Angeles-based award-winning actress Teresa Ruiz is considered one of the most prominent actresses in Mexican cinema and further solidifies her acting chops in the premiere season of Netflix's Narcos companion series Narcos: Mexico, where she stars opposite acting veterans Diego Luna and Michael Peña as the gorgeous and ambitious 'Isabella Bautista,' who is primed to become the future 'Reina' (hint hint) of the Mexican drug cartel. Already receiving rave reviews with CNN saying, "the series remains as addictive as ever" and Uproxx declaring"'Narcos: Mexico' is the most intoxicating season of the Netflix hit yet" the just-released series is currently streaming on Netflix. As the name Narcos: Mexico suggests, Pablo Escobar's Colombia has been left behind for 1980s Mexico in the slick, solidly crafted prequel companion season of Netflix's hit Narcos series. The events of the new season focus on the origins of the Mexican drug war, focusing on 'Kiki Camerena' ( Michael Peña) a DEA agent who transfers from California to Guadalajara, Mexico, who finds himself picking up the trail of 'Miguel Ángel Félix Gallardo' (Diego Luna), who is well on his way to becoming Mexico's first major drug kingpin. 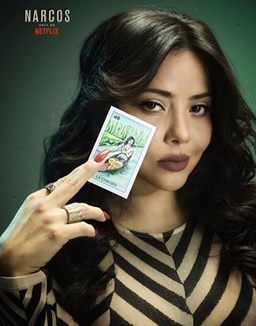 "Even though the two opposing alpha males are the show's main attraction, there are some memorable supporting characters worthy of note, namely Narcos' first great female character, 'Isabella Bautista,' played by Teresa Ruiz." -- IGN. The narcotics business during the '80s is definitely a man's game, but 'Isabella Bautista' - Gallardo's right-hand woman who has enmeshed herself in the world of the powerful and elite - wants to shake things up by claiming a piece of the cocaine pie for herself. A fascinating character, she has to rely solely on her wits in order to compete with the men who believe she's unworthy of a place "at the table." As glamorous and beautiful as she is deadly, Bautista is climbing to the top of the Mexican underworld and as the series hints to, is primed to become the future 'Reina' of the drug pin. The new season makes for an enjoyable new chapter for fans of the Netflix series and those who have never watched a single episode as the series is acutely aware of the present-day prominence Mexican cartels would achieve - ' El Chapo', the former leader of the Sinaloa Cartel who is currently on trial in New York, is a minor character on Narcos: Mexico as a young lieutenant in Mexico's first formed cartel. A lifetime member (and currently the only Latina) of the prestigious Actors Studio, where she has studied under the guidance of Al Pacino and the late Martin Landau, Ruiz's acting work has garnered her international awards for Best Actress including "The Silver Mayahuel" at the Guadalajara International Film Festival, "The Prix d'Interprétation Féminine" at the Amiens International Film Festival in France, the "India Catalina" in Colombia, "The Canacine Award," and the Mexican Academy Award: "The Ariel". Ruiz notably starred as 'Lucia' in the drama film ROAD TRIP (Viaje Redondo) which shot her into critical stardom and awards recognition. Ruiz currently has a starring role as 'Nadia Basurto' in the critically acclaimed political thriller Aquí en La Tierra, a co-production between Gael García Bernal and Diego Luna's production company and FOX Networks. The 8-episode drama series is written and directed by some of Mexico's most renowned filmmakers and was the only Latin American title competing in the 2018 inaugural edition of The Cannes Film Festival: Series. Other notable works include a role in Gregory Nava's controversial film BORDERTOWN alongside Jennifer Lopez and Antonio Banderas, co-starring in the Michael Bay-produced series The Last Ship, and in The Delivery co-starring opposite Mickey Rourke and directed by Louis Leterrier. Through her role as Executive Partner of production company Machete, the film LEAP YEAR (AÑO BISIESTO) by director Michael Rowe won the "Camera d'Or" award at the 2010 Cannes Film Festival. With a star power on the rise, Teresa Ruiz is making a mark on Hollywood. We would love to set up an interview with you and her to discuss her role on Narcos: Mexico and her career as a whole. For more information on Teresa Ruiz, check her out social media via Facebook, Twitter, and Instagram. Natasha and 10 others upvoted this.